We’d love your help. Let us know what’s wrong with this preview of What Do You Do With a Tail Like This? by Steve Jenkins. Readers can explore the many amazing things animals can do with their ears, eyes, mouths, noses, feet, and tails in this beautifully illustrated interactive guessing book. To ask other readers questions about What Do You Do With a Tail Like This?, please sign up. This delightful picture book for Kindergarten to grade 4 uses creative illustrations and riddles to capture the interest of a wide audience. The illustrations are created with vibrant cut-paper collage, showing portions of one part of five animals on one page with the inquiry question “What do you do with a_____ like this?” The answers are found as the page is turned, with a brief description of how animals use their body parts. This format offers suspense for the reader as they consider each in This delightful picture book for Kindergarten to grade 4 uses creative illustrations and riddles to capture the interest of a wide audience. The illustrations are created with vibrant cut-paper collage, showing portions of one part of five animals on one page with the inquiry question “What do you do with a_____ like this?” The answers are found as the page is turned, with a brief description of how animals use their body parts. This format offers suspense for the reader as they consider each inquiry. The artwork is beautiful, colorful and lends itself to creating animals and their body parts that look almost real. The facts are interwoven throughout the book but the author provides more detail about each animal in a summary at the end of the book. Very informative, engaging and contains some of the best cut-paper collage I've ever seen! This is a fantastic book. The bright colors and detailed illustrations make this book very intriguing. This book is an interactive book for readers. As one reads the book, it will ask questions like “what do you do with a tail like this” or “what do you do with eyes like these”. It also shows images of several different body parts of animals like eyes and tails. Then, you turn the page and it gives readers an answer. It shows the full animal and gives a short insight on what animals use certain This is a fantastic book. The bright colors and detailed illustrations make this book very intriguing. This book is an interactive book for readers. As one reads the book, it will ask questions like “what do you do with a tail like this” or “what do you do with eyes like these”. It also shows images of several different body parts of animals like eyes and tails. Then, you turn the page and it gives readers an answer. It shows the full animal and gives a short insight on what animals use certain body parts for. What Do You Do With a Tail Like This? is a wonderful informational book by Steve Jenkins and Robin Page. This book was a Caldecott Honor Book and readers will see why upon the first page. The book follows a question and answer structure with vibrant pictures and unique page layouts. Readers' eyes jump across the pages matching the text to the animal. Readers learn all about how different animals use their feet, tails, noses, mouths, ears, and eyes. The text uses repeated phrases that students ca What Do You Do With a Tail Like This? 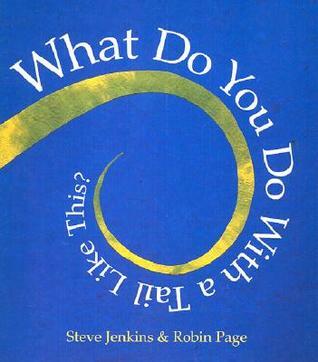 is a wonderful informational book by Steve Jenkins and Robin Page. This book was a Caldecott Honor Book and readers will see why upon the first page. The book follows a question and answer structure with vibrant pictures and unique page layouts. Readers' eyes jump across the pages matching the text to the animal. Readers learn all about how different animals use their feet, tails, noses, mouths, ears, and eyes. The text uses repeated phrases that students can start to read along with you. This book will draw young readers in whether it is listening to a teacher or parent read aloud or the child reading it alone. The illustrations are a perfect pair to the information the author gives on that specific animal. [close:] Hardcover book & CD set narrated by James Naughton with music by David Mansfield includes track 1, story with page-turn signals; track 2, story without page-turn signals; 6 tracks of animal facts. The book is beautifully illustrated using cut-paper art, presented as an interactive guessing game, with simple text that even wee little ones can follow along. 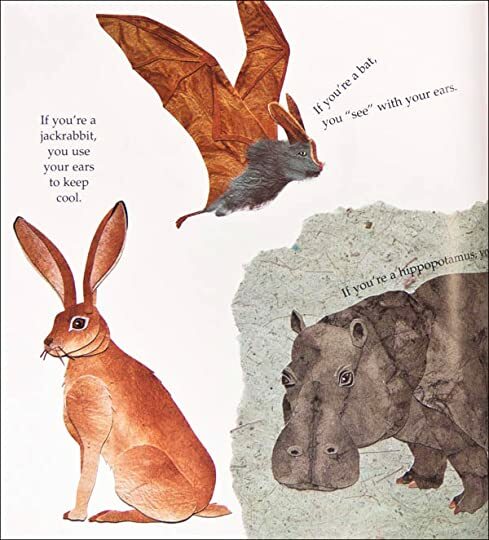 A set of animals are displayed in each double-page spread - well, mostly their body part relevant to the accompanying text is dis [close:] Hardcover book & CD set narrated by James Naughton with music by David Mansfield includes track 1, story with page-turn signals; track 2, story without page-turn signals; 6 tracks of animal facts. A set of animals are displayed in each double-page spread - well, mostly their body part relevant to the accompanying text is displayed first to encourage the little minds to guess. For instance, the first two-page spread shows zoomed in views of the noses of alligator, platypus, mole, elephant, hyena - with a simple question "What do you do with a nose like this?" Part of the fun initially is to identify the various noses as belonging to the corresponding animals. The following page shows the animals in full form, with a brief sentence highlighting what each animal does with its nose. If you are a platypus, you use your nose to dig in the mud shows an accompanying picture of a platypus sticking its nose in the mud. Similarly, If you are an elephant, you can give yourself a bath with your nose shows an elephant splashing itself with a trunk full of water. The answers describe how each animal uses that particular body part (be it nose, or ears, or tail, or eyes, or mouth, or feet) in a slightly differently way. And so we embark on an interesting study of animals where we discover that some animals use their noses for digging, some use their ears for seeing, some use their feet to walk on water, some use their tails to sting, and some even squirt blood from their eyes. Fantastic info text! Steve Jenkins did a marvelous job at describing what different animals can do with different parts of their bodies in a very fun and engaging text. 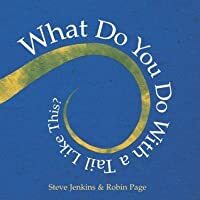 I really enjoyed the fact that Jenkins asks children "What do you do with....?" for each body part and he includes pictures of the animals so kids can make predictions and make connections. These initial questions help tap into their background knowledge and it is a great way to get children excited about sharing relevant informa Fantastic info text! Steve Jenkins did a marvelous job at describing what different animals can do with different parts of their bodies in a very fun and engaging text. I really enjoyed the fact that Jenkins asks children "What do you do with....?" for each body part and he includes pictures of the animals so kids can make predictions and make connections. These initial questions help tap into their background knowledge and it is a great way to get children excited about sharing relevant information that might answer the question. Beginning readers and ELLS can use the illustrations to help them decode certain words/phrases; there is an image of a platypus digging in the mud (which answers the question "what would you do with a nose like this? "), even if the kids are unsure of what the text says they can always try to "read the pictures" to make sense of it, and to participate in discussions. At the end of the book Jenkins includes a section that includes a small bio with details about each animal. I would recommend this book for lower elementary students, the book provides lots of information but it does so in a fun non-overwhelming way so they kids can actually enjoy it without having to worry about understanding big words or abstract concepts. This book could also be used for upper elementary students (at least the last few pages), it could be a great way to get info on multiple animals. The nature of this book screams read aloud! the format in which the book was written gives room for discussion and making predictions. It would also be used for a shared reading since some parts of the text (like the questions) follow a repetitive pattern that the kids will soon come to learn. Overall great book, specially if your child is very interested in biology or the natural environment. - I love this book for small children. It provides students with a lot information on all the cool things that animals can do with all the parts of their body, not just their tales. This game is fun and allows readers to play along by having a little guessing/fill in the blank game going throughout the book. Not only is it fun for the students, but its fun for the teacher to read as well. -Students could look through book and pick out their favorite animal. Have students draw the animal they chose and display in class. -What Do You Do When Something Wants to Eat You? If you like learning interesting facts about animals, you will enjoy this book! Find out how different animals use their eyes, ears, noses, and tails. Each page has animal parts that belong to all different kinds of animals. Your job is to try and guess what animal they belong to! This is perfect for a read aloud to introduce the genre of non-fiction to young students in Kindergarten or even pre-school. The reading level is appropriate for first or second grade students, although the information If you like learning interesting facts about animals, you will enjoy this book! Find out how different animals use their eyes, ears, noses, and tails. Each page has animal parts that belong to all different kinds of animals. Your job is to try and guess what animal they belong to! This is perfect for a read aloud to introduce the genre of non-fiction to young students in Kindergarten or even pre-school. The reading level is appropriate for first or second grade students, although the information on the animals in the back of the book is much more difficult to read. You can find out more about the author and how he makes his illustrations out of paper on his website, www.stevejenkinsbooks.com. This is book I would gift to all children! This a fun read that gives children a better understanding animals and how they too rely on their bodies, like humans. Noses, ears, feet are also highlighted as well as the titles suggests, tails! Very creative book discussing animals. This book can be very helpful when covering animals and their different body parts. This book was such an informative read, and I learned so many things by reading this book that I had never even thought of before! What Do You Do With a Tail Like This? is an absolutely wonderful book and keeps the reader interested and engaged throughout the entire story. I loved the structure of this text because the author first asked a question, and then explains the answer in a very short, sweet, and “kid-friendly” manner. The pictures in this story are incredible and look as though they we This book was such an informative read, and I learned so many things by reading this book that I had never even thought of before! What Do You Do With a Tail Like This? is an absolutely wonderful book and keeps the reader interested and engaged throughout the entire story. I loved the structure of this text because the author first asked a question, and then explains the answer in a very short, sweet, and “kid-friendly” manner. The pictures in this story are incredible and look as though they were almost collaged with textured paper to make the animals seem incredibly realistic. A particular picture that blew me away was the skunk illustration because the image looks as though it was created with stretched out cotton balls to give the illusion of fur. This book talked about a diverse amount of animals, and asked various questions beyond what can be done with a tail. The author addressed what eyes, ears, and noses help animals do, to list a few. I would classify this book as an informational, nonfiction text. This story is an extremely delightful read and can be read with students as young as preschool, and carry through to third grade. This would be a great read-aloud for all of those grade levels, but can be read independently in third grade. This would be an excellent mentor text to teach predictions and various animal adaptations. During a whole group read-aloud, the students could predict the animal the author is illustrating, and then once the animal is discovered, the teacher and students can recap and discuss the importance of that particular fact. Some instructional activities to accompany this text would be an animal matching game, where the teacher would create cards with the various animal noses, and then the students have to flip the card over to match the nose to the animal. Once the students make a match, they would then have to state what that part, in this case how the nose, helps that animal. If they get the correct fact, then the students would keep the cards. This is a great activity for students in first through third grade to get some hands on exposure with the book. The teacher could also poll the students about their favorite animal/animals they learned about using a digital tool, such as Google Forms, and then the teacher could find corresponding videos for the students to watch in centers, and then that may provoke students to do further research and learn more about that particular animal. Steve Jenkins is an author that I am becoming more familiar with. His children’s books provide wonderful opportunities to teach students about nonfiction texts and provide activities that follow along. In What Do You With a Tail Like This?, Jenkins encourages young readers to put their imaginations to work as they consider the uses to which isomorphic structures may be put by different organisms in a different ecological contexts. For an upper elementary grades, this might provide an avenue for Steve Jenkins is an author that I am becoming more familiar with. His children’s books provide wonderful opportunities to teach students about nonfiction texts and provide activities that follow along. In What Do You With a Tail Like This?, Jenkins encourages young readers to put their imaginations to work as they consider the uses to which isomorphic structures may be put by different organisms in a different ecological contexts. For an upper elementary grades, this might provide an avenue for exploring the correspondence between the human animal and other forms of life as that pertains to neo-Darwinian theories of the descent of species and some of the inconsistencies within that whole. This will allow students to question the nature of science as such and consider its epistemological validity as well as the necessary interpretive valence applied by any observer to the theories and hypotheses of science. 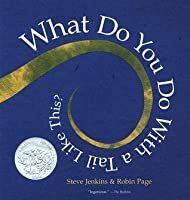 The first Caldecott award winning book I chose to ready was “What Do You Do with a Tail Like This?” This book is written by Steve Jenkins and Robin Page. The book starts by illustrating ears, tails, eyes, feet, etc. Each new part of the body had a page that that specific new body part was focused on. The page that followed would be different animals who had that body part, and what they used that body part for. Each story with an animal had text to go along with what was being illustrated. 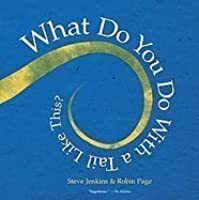 As th The first Caldecott award winning book I chose to ready was “What Do You Do with a Tail Like This?” This book is written by Steve Jenkins and Robin Page. The book starts by illustrating ears, tails, eyes, feet, etc. Each new part of the body had a page that that specific new body part was focused on. The page that followed would be different animals who had that body part, and what they used that body part for. Each story with an animal had text to go along with what was being illustrated. As the title is “what do you do with a tail like this?”, there was an image of a skunk who was lifting his tail to go along with the illustration of the tail. 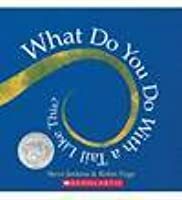 The first Caldecott book I chose to ready was “What Do You Do with a Tail Like This?” by Steve Jenkins and Robin Page. It started with ears, then tails, then eyes, then feet and so on. Each new body part started with a page that was specifically zoomed in on the part that was being talked about. On the next following page, it included those animals, zoomed out, and what each animal uses that body part for. The drawings and paintings of the animals were immaculate. The little story of that animal The first Caldecott book I chose to ready was “What Do You Do with a Tail Like This?” by Steve Jenkins and Robin Page. It started with ears, then tails, then eyes, then feet and so on. Each new body part started with a page that was specifically zoomed in on the part that was being talked about. On the next following page, it included those animals, zoomed out, and what each animal uses that body part for. The drawings and paintings of the animals were immaculate. The little story of that animal had corresponding text with the topic. For example, when it got to “what do you do with a tail like this?”, the image of the skunk would spray the words, while lifting his tail. The movement of the pictures really emphasized exactly what the animals were doing how how specific parts of their bodies were being used. We were able to see the platypus sniffing in the mud, the hippopotamus closing his eyes underwater, the giraffe brushing off flies with his tail, and the lizard literally breaking his tail off to get away. Reading this for the first time as a college student, was so much fun and I think that any student would enjoy reading this book and looking at all of the pictures. Therefore, I think that this children’s picture book definitely deserved the Caldecott Award. While being educational and lighthearted, the pictures were the key aspect to the book. The pictures, themselves, told the story. You could see all of the animals living their daily life and using their everyday sense with the body parts they need. What Do You Do With a Tail Like This? is a beautifully illustrated informational text and was awarded the Randolph Caldecott Medal. Written and illustrated by Steve Jenkins and Robin Page, each page is filled with beautiful cut-paper collage images. This fun engaging non-fiction text would be great for Pre-k through 4th-grade students. What Do You Do With a Tail Like This? Is an engaging way to introduce informational texts to students in Kindergarten through 2nd-grade. This interactive text giv What Do You Do With a Tail Like This? is a beautifully illustrated informational text and was awarded the Randolph Caldecott Medal. Written and illustrated by Steve Jenkins and Robin Page, each page is filled with beautiful cut-paper collage images. This fun engaging non-fiction text would be great for Pre-k through 4th-grade students. What Do You Do With a Tail Like This? Is an engaging way to introduce informational texts to students in Kindergarten through 2nd-grade. This interactive text gives all students many opportunities to make predictions and participate in group discussions. This text can be connected to a science curriculum as the text is filled with animal facts. Both young and old will enjoy the fascinating information packed in this book. I was left seeking more knowledge on the fact that field crickets have ears on their two front legs. Before I pulled out my cell phone like many are tempted to do, I flipped to the end of the book, where Jenkin’s provided me with a wealth of knowledge on field crickets. This “glossary” provides more details of the animals seen in the book, providing exposure to text features. Jenkin's book would make a wonderful mentor text to help students develop an interest in different animals to write about. Or simply a fun non-fiction read aloud! This book has won the Caldecott Medal. "What Do You Do With a Tail Like This?" is appropriate for kindergarten to fourth grade. This book is about different animals, and their different features. This book is an interactive guessing book, and it includes information about the nose, ears, tails, mouths, and eyes of many different kinds of animals. There is more information at the back of the book, and readers can learn even more about these animals with this. I like the design of this book, and the This book has won the Caldecott Medal. I like the design of this book, and there is plenty of information within its pages. Students who are interested in animals will love this book, and the facts included are fun and memorable. Reading this book will give students a better understanding of animals and the reasons for their features. A very cute and interesting book overall. Book Summary: Different animals are discussed for the many ways they use their various body parts. Characteristics that support the genre: This book provided infomration on animals and the ways they use their bodies. At the end of book the author goes more in depth about each animal in the book. Presentation: When discussing each body part (ears, eyes, mouths, noses, feet and tails) the author shows the body part on various animals and asks a question like "What do you do with a nose like this?" On the next page the author teslls the reader what each animal does with their nose. He proceeds to do this with each body part. Classroom integration: This is a good inquiry book. While reading it we could have a class discussion on what the students think each animal does with the various body parts. When we read the page where the author tells us what each body part does we can check if we were right or not. This is a way to connect science and literature. This book goes through many animal body parts. It goes through ears, tails, nose, etc. On each page it explains the purpose of animals' specific body parts. There are pictures of the animals with the description next to them. It goes through many animals. Some of them were: monkeys, elephants, mountain goats, and anteaters. This book is great because of the specific types of animals. It does not just group all of a type of animal together. For example, it does not group all of snakes together. It talked about a specific type of snakes and how they eat eggs. It explained how not all snakes eat eggs. There were also insects included and many different species of birds. A. This is an interactive book because there are questions throughout the story for students to respond to about various animals. It also contains illustrations that correlate with the text which makes it a picture book. B. Perspective is a huge part of this book. The pages show parts of animals, such as the nose, tails, or legs, and asks what the animals do with that body part. The page following the question, shows the entire animal and explains the importance of that body part. The illustrator uses perspective effectively by showing a close up of the animal so the children must guess what animal it is. C. I would use this book in a small group of students. This could be a story when working on predictions or when on the concept of animals. Steve was born in 1952 in Hickory, North Carolina. His father, who would become a physics professor and astronomer (and recently his co-author on a book about the Solar System), was in the military and, later, working on science degrees at several different universities. We moved often. Steve lived in North Carolina, Panama, Virginia, Kansas, and Colorado. Wherever he lived, he kept a menagerie of Steve was born in 1952 in Hickory, North Carolina. His father, who would become a physics professor and astronomer (and recently his co-author on a book about the Solar System), was in the military and, later, working on science degrees at several different universities. We moved often. Steve lived in North Carolina, Panama, Virginia, Kansas, and Colorado. Wherever he lived, he kept a menagerie of lizards, turtles, spiders, and other animals, collected rocks and fossils, and blew things up in his small chemistry lab. Because he moved often, Steve didn't have a large group of friends, and he spent a lot of time with books. His parents read to him until he could read himself, and he became an obsessive reader.